KOKOMO, Ind. – Just call him Kingston. Kingston Cougar thanks the contestants with some cool prizes! The Cougar mascot is no longer nameless after “Kingston” received the most votes by the student body at Indiana University Kokomo. The winning name was announced at Thursday night’s women’s volleyball match, following a month-long contest. 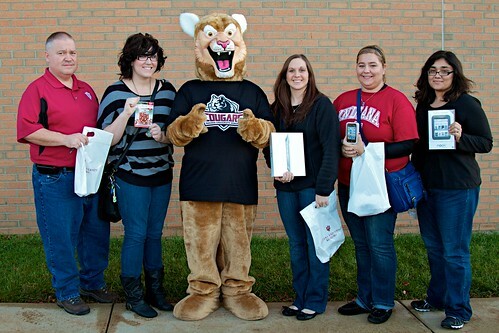 Kourtney Cox, a senior elementary education major, submitted the winning moniker and took home the top prize of an iPad2. The name Kingston has historical significance for both the Kokomo community and the university. George Kingston invented the carburetor in Kokomo in 1902, and later purchased the Seiberling Mansion. In 1947, the Seiberling Mansion, also known as the Kingston Home, became the home of IU Kokomo until it was moved to its present site in 1965.